Lock in a great price for Vedana Lagoon Resort & Spa – rated 9.4 by recent guests! Low key location, clean large rooms. The staff was very attentive and the food was delicious! The massage at the spa was the best i've ever had and the facilities are generally very good. Great views, comfortable bed and extremely friendly staff. The bed was the largest i've ever slept in. 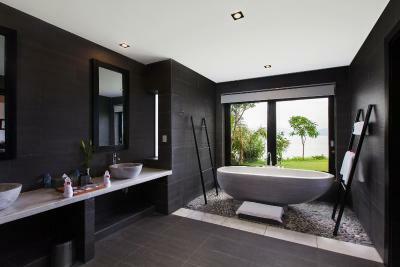 The high ceiling, huge bathroom with solid marble bath tub, and one outdoor shower, the view from the full size windows over the lagoon and mountains behind, the expansive terrace, it was a pleasure being indoor as being outdoors around the hotel grounds. The free bikes was a nice touch, and very well maintained. The staff are super friendly and particularly helpful with small babies and there are 4 different playrooms for the kids. The breakfast was terrific, with lots of options for every taste. The quiet tranquility of the surrounds areas of Vedana is the right therapy coming from the noise and pollution of urban cities. Loved everything. The rooms were slightly dated. No need to put table cloths on the tables and to have two tables in one room was a bit much. I am a minimalist so for some it’s ok.
Everything. A paradise... To feel like a king and a queen! The breakfast is incredible and the rooms are absolutely beautiful and clean. The staff is super friendly and we enjoyed our stay a lot! 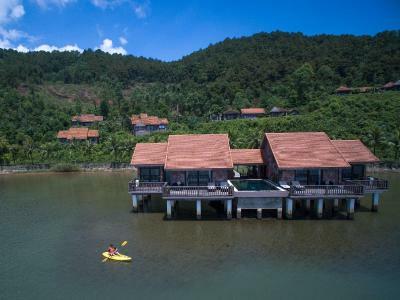 Vedana Lagoon Resort & Spa This rating is a reflection of how the property compares to the industry standard when it comes to price, facilities and services available. It's based on a self-evaluation by the property. Use this rating to help choose your stay! One of our top picks in Hue – and a guest favorite. 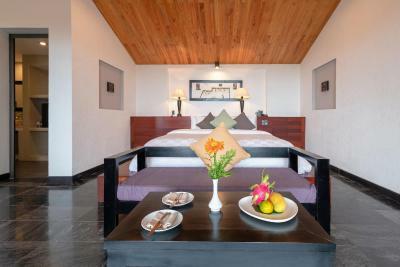 Vedana Lagoon Resort & Spa is located along a peaceful lagoon between Hue and Hoi An. 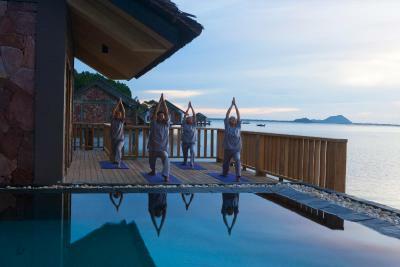 This 5-star resort offers luxurious over-water villas, free WiFi, an outdoor pool and spa wellness services. The spacious villas and bungalows at Vedana feature modern décor with traditional accents. A flat-screen satellite TV, DVD home entertainment system and mini-bar are included. Private bathroom comes with shower facility and free toiletries. Room service is provided 24 hours. Guests can enjoy relaxing massage treatments and beauty services at the spa. Tai Chi and yoga classes are available. 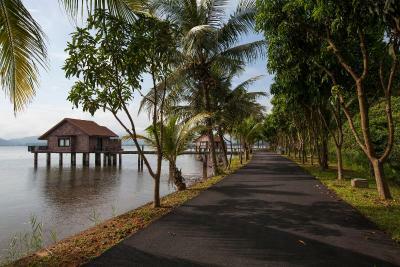 The resort also opearates a tour desk and water sports facilities. Fresh seafood and fantastic views are offered at The Horizon Restaurant. Cooking classes and private dinner can be arranged at The Lantern House upon request. A romantic private dining experience under the stars is available at The Twilight Experience. 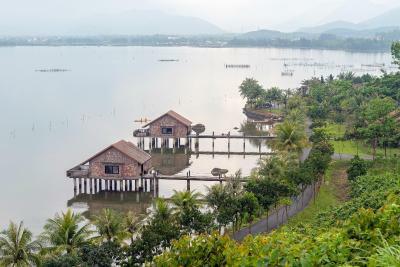 It is 24 mi to Hue and 16 mi to Hue Airport from Vedana Lagoon Resort & Spa. Tu Hieu Pagoda is around a 50-minute drive away. When would you like to stay at Vedana Lagoon Resort & Spa? Located over the clear waters of the lagoon, this 1312 ft² bungalow features 2 bedrooms, a private pool, separate living space and a sundeck. 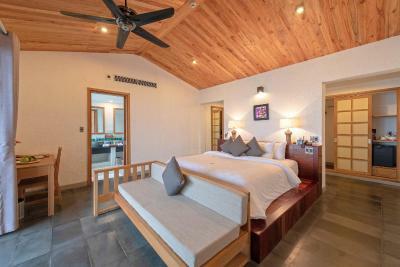 Set on the side of a hill, this bungalow features a living room and a spacious bedroom opening out to the sundeck, which offers panoramic views of the vast lagoon. 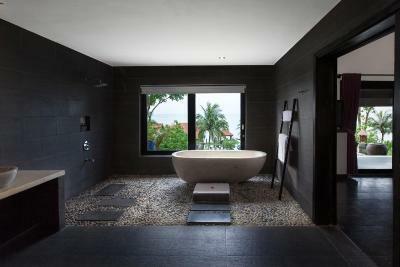 Set on the side of a hill, villa features a private plunge pool and luxurious bathroom with an outdoor shower. 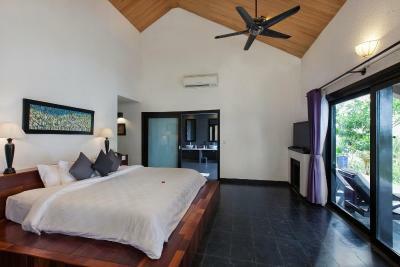 This bungalow is located over the clear waters of the lagoon. Most bungalows offer a sundeck where guests can relax and enjoy the cool breeze. 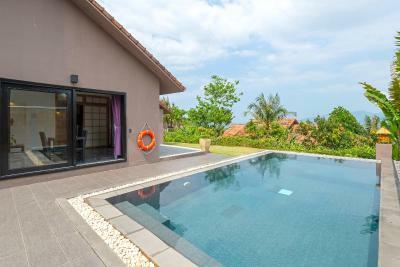 Set on the side of a hill, this luxurious 2-bedroom villa features a private pool with a sundeck and kitchenette. Also includes a garden overlooking the lagoon. 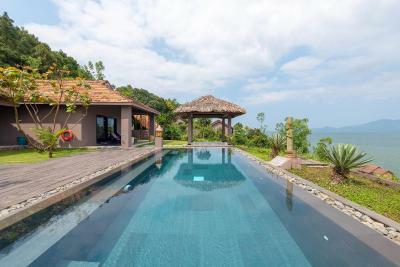 Set on the side of a hill, this villa features 2 connecting bedrooms on the same floor, either upstairs or downstairs. It features a breathtaking view of the lagoon. 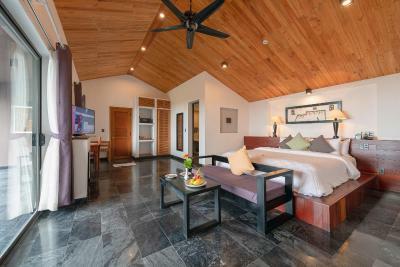 Lagoon View Deluxe are rooms located by the Vedana Wellness & Spa with an uninterrupted lagoon view. Each unit includes 5 rooms on the upstairs and 5 rooms on the downstairs. The area is the best place to contemplate the sunset view and local fishing boats in good weather days. Located on the edge of the water with uninterrupted lagoon and sunset views, this two-bedroom unit is a short stroll to main restaurant and pool. This bungalow is located over the clear waters of the lagoon and offers a sundeck. A balcony, mini-bar and bathrobe are included. House Rules Vedana Lagoon Resort & Spa takes special requests – add in the next step! Any additional older children or adults are charged VND 1279280.51 per night for extra beds. Vedana Lagoon Resort &amp; Spa accepts these cards and reserves the right to temporarily hold an amount prior to arrival. Vedana Lagoon Resort & Spa accepts these cards and reserves the right to temporarily hold an amount prior to arrival. Please note that the resort offers chargeable transfer from Hue Airport or Da Nang Airport. Guests are kindly requested to inform the property in advance if they wish to make use of this service. Contact details can be found on the booking confirmation. Reservations office is open daily between 08:00 - 17:00 daily. Guests can also contact the front desk directly. This service is subject to availability and management's confirmation. 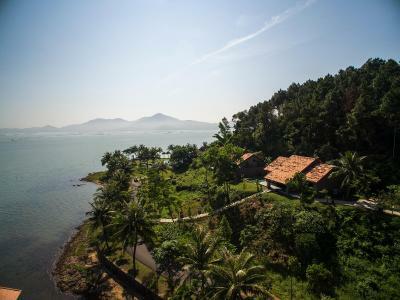 Vedana Lagoon Resort offers daily complimentary shuttle bus to/from Hue City and Canh Duong beach upon request. Kindly inform the property at least 12 hours in advance if you wish to make use of this service. For further information, guests are to contact the property directly. Early check-in and late check-out are upon request and subject to availability. Surcharges may apply. Children under 4 years of age will enjoy breakfast free of charge. First child from 4 to 9 years old will be charged USD 9 (including breakfast) per child per night when using existing bedding. Second child AND child over 10 years are considered as adults. Extra bed or sofa bed is required at USD 55 (including breakfast) per bed per night. Above rate includes taxes. Supplements for children policy are not calculated automatically in the total costs and will have to be paid for separately during your stay. Guests who book 'breakfast included' rate for booking date and staying date from 6 December 2018 to 20 December 2019 can enjoy one 30-minute spa treatment (for 1 person per room per stay). Set-menu dinner on December 24, 2018 and December 31, 2018 will be applied for all guests at the property. More information will be sent to guests after the booking is made. Just perfect place to relax and enjoy peace and beauty. Great staff. Good food. Water-villa was amazing. Very quiet place. Lots of sports activities (tennis, yoga, gym...). Area outside resort was also very lovely and authentic and easy to go around by bike. For sure coming back here! There’s no !!! Perfect !!! Cozy placed for refreshing ! Sound proof between connecting rooms is very bad. The view: so beautiful, words can’t describe. Very tranquille. Very nice pools, rooms and great staff. Very magicial and peaceful place if you wanna relax after busy streets of Hanoi and Da nang. Lovely staff and specially An who looked after us for all our stay. Excellent and very professional! Highly recommend that resort for couples or honeymoon. Nothing except - too many plastic water bottles. It was great that they provide water through out the day but on average we trashed at least 8 small bottles a day. If they could provide water in a large glass bottle that could be refilled throughout the day that would be great. In that we could have refilled our travel bottles and no plastic waste. It was the perfect place for some downtime and chilling. The staff were magnificent, very friendly and helpful and we had a great three days here. And we had a upgrade which was lovely. Great location with stunning views across the lagoon. We booked a very expensive tour of Bach Ma followed by a transfer to Hoi An. The trip lasted 8 hours and included no food, and the driver spoke no English which meant we spent the whole day in silence. As the hotel is not close to anything you are forced to pay the expensive tour prices if you want to get out of the hotel, which you may not want to do as the hotel is lovely! Lovely hotel, beautiful location and great facilities. It's a amazing experience. Facility, staff, food is perfect. It's a lovely place to relax. I highly recommend this resort. Very professional service, stuff. 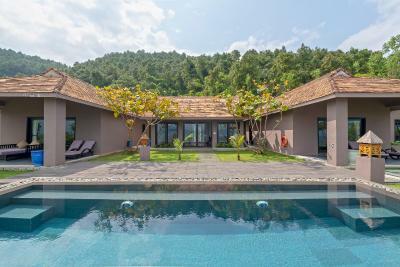 Nice location with the taste of Vietnam, clean Villas, great food. We won’t hesitate coming back.